Balloon Bouquets & Creations - Face The Colour- Balloon Art and Decor, Facepainting and more! Our Balloon Bouquets and Sculptures make a unique gift and are sure to have the 'wow' factor. The balloons we use are high-quality latex and foil balloons from the top brands in the industry to ensure that you, our customer, will get the most out of our products. 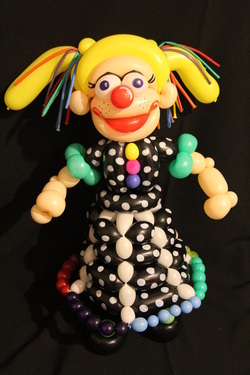 Each one of our Balloon Bouquets and Sculptures can be customized to meet your individual requirements. Please also have a look at Balloon Entertainment for more small balloon sculptures that could be added to a Bouquet or bigger Sculpture as an additional element.